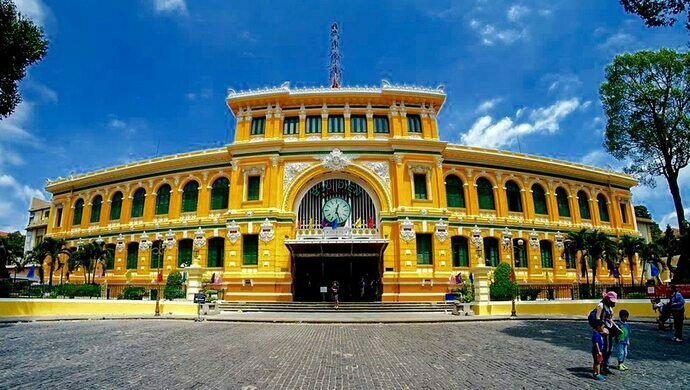 Built during French colonial times, the Saigon Central Post Office is perhaps among the most impressive post offices in Southeast Asia. Often erroneously attributed to Gustave Eiffel, it was, in fact, the last work of Marie-Alfred Foulhoux, Saigon’s acclaimed Architect-in-Chief. A memorial to the monk who set himself on fire to protest the persecution of Buddhists in Vietnam. 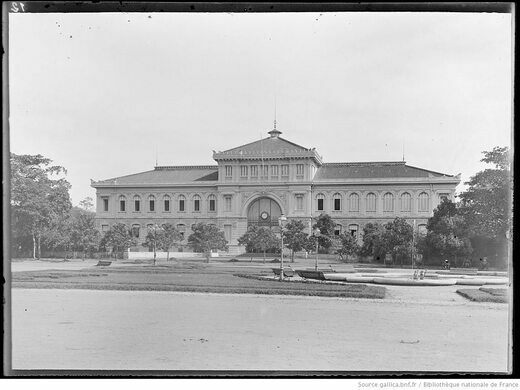 In 1874, the French architect Marie-Alfred Foulhoux (1840-1892) moved to the recently established French colony of Cochinchina in South Vietnam. 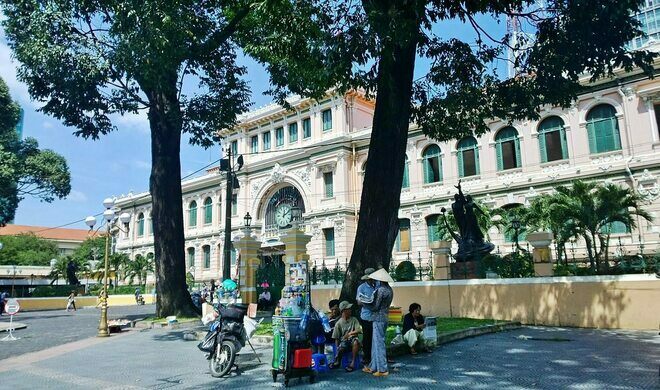 After five years in Saigon, he was appointed Architect-in-Chief and spent much of the rest of his life designing and building some of the most important buildings in the city, including the Palais de Justice, the Customs Department building, and the Lieutenant Governor’s Palace. 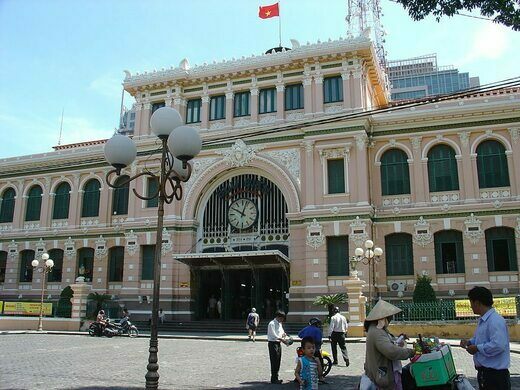 His final work, built between 1886 and 1891, was the Saigon Central Post Office. Constructed around a prefabricated cast iron frame, with a towering vaulted ceiling and arched windows, the post office mixes European architecture—French, Gothic and Renaissance—with East Asian designs. Along the light-yellow Neo-Baroque facade, window plaques bear the names of leading scientists and philosophers, including Descartes, Morse, Ampere, Volta, Ohm, and Faraday. The decoration of the roof ridges, meanwhile, was inspired by Khmer art. Walk inside, and you’ll be struck by the sense of space under the huge vaulted ceiling, supported by two rows of steel pillars, not too dissimilar to an old European railway station. 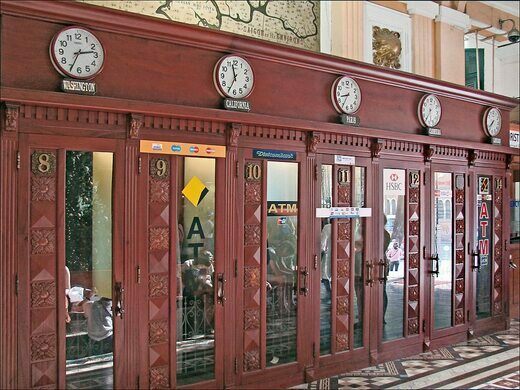 It’s very much a colonial building, with ornate wooden counter-tops, patterned tiled floors, and antiquated telephone boxes. But though much of the space feels European, it contains a few reminders that you’re still in Saigon, such as the large portrait of Ho Chi Minh on the far wall. That, and the two historic maps painted on either wall, one depicting the telegraph lines of southern Vietnam and Cambodia in 1892, and the other a map of Saigon and its surroundings in 1892. 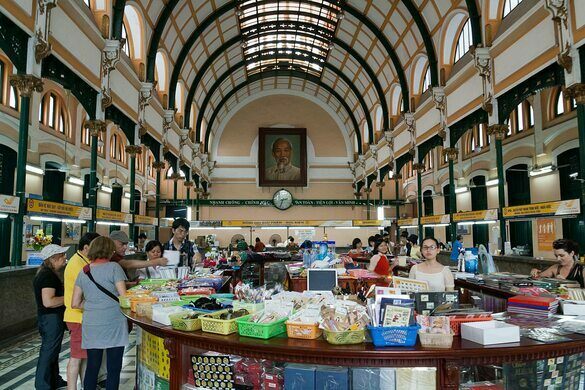 Another iconic feature of the post office is Mr. Duong Van Ngo, who you’ll typically find sitting at a table underneath the portrait of Ho Chi Minh. 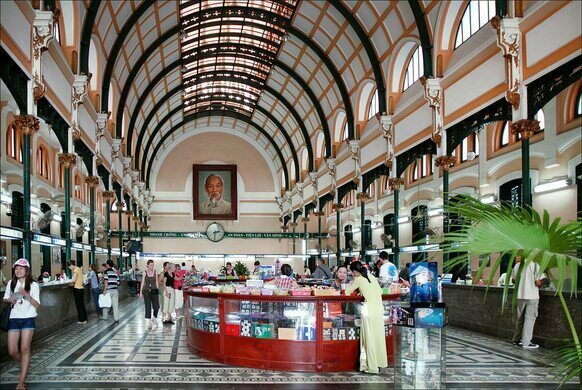 Mr. Ngo, now in his late 80s, has been working at Saigon Central Post Office since he was 17. For more than 25 years, he has faithfully served as the post office’s letter writer, writing letters for those who cannot write for themselves. Pen in hand, he writes in French and English, and charges about 50 cents per page. 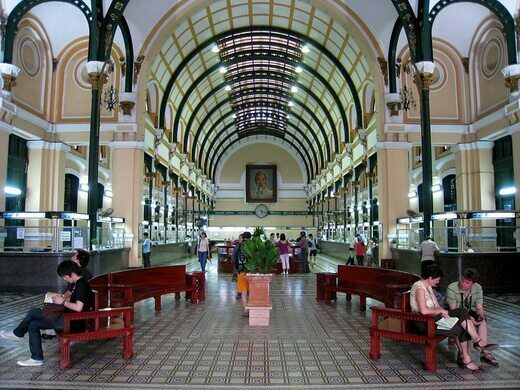 Saigon Central Post Office is a fully-functional post office, from where you can send and receive mail, buy stamps and postcards, make international calls, and exchange foreign money. 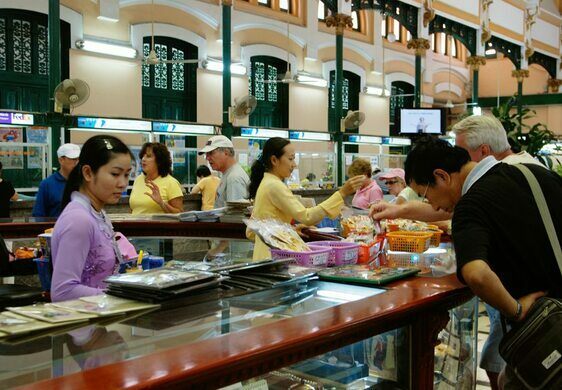 It's located at 2 Công xã Paris, Bến Nghé, close to Diamond Plaza and Notre Dame Cathedral in downtown Ho Chi Minh City. The post office's business hours are from 8 a.m. to 5:30 p.m., although the building sometimes remains open for longer for visitors who just want to look around. This historic spot was where America's involvement in the Vietnam War officially came to an end.